The options are located on the Start Menu in the bottom left of the application. In Manage Users, you manage your users, assign them to groups, and give access rights to your users. 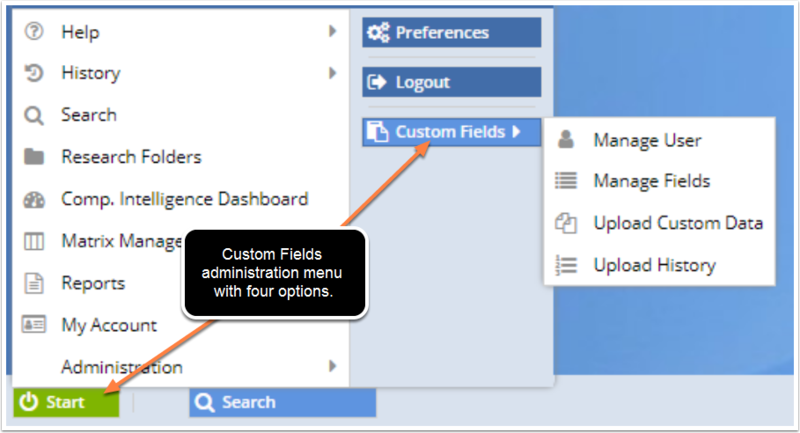 In Manage Fields, you can create new data fields and assign access rights to the various fields to users and groups. Use Upload Custom Data to upload data in mass. The data must be in .csv files (see Importing Custom Data into AcclaimIP in this help manual for more information). Upload History is a basic utility to view what data has been uploaded to your custom fields, by whom, and when they did it.